Cairo is the capital city of Egypt, and with its 12 million (and an agglomeration of up to 15 million), it is the most popular city in the country. Its name means „Winner“, but due to its great importance not only for Africa but also as a link to Europe, it is often nicknamed „Big Mango“ or „Mother of the World“. The whole city is situated along the banks of the Nile River, with the newer neighborhoods centered closer to its shores, and the older ones are further away from it. If you are going to visit Cairo in the near future, you should not miss this article, filled with information not only about urban transport but also about interesting places you can visit during your visit. If you are in Cairo, surely you should not miss the seventh wonder of the world – Pyramids in Giza. Their magnificence will captivate you. In the center of the historical part, you can see many different ancient monuments. One of them is the remains of the Babylonian fortress. The atmosphere of the entire city will undoubtedly leave you an unrepeatable impression. You will experience some of the city’s rush in Midan El-Tahreer Square. Here you will be at the center of all the events. And here you can enjoy a wide range of local specialties, cafes as well as shops. Book your accommodation in Cairo! Do you prefer hotels more? Would you rather enjoy a holiday in a nice apartment or hotel where you have All inclusive service and do not worry about anything? Especially for you, we have negotiated a 10% discount on the price of accommodation on Booking.com. So do not hesitate and take advantage of this extraordinary offer. Cairo’s metro started its operation in 1987. The metro was built after the number of people using urban public transport rose rapidly. Egypt thus gained its primacy in the Arab world among countries with an underground transport system. Interestingly, carriages were used in the Cairo subway, which only serves to transport women without the presence of men. These wagons are marked with a red or green stripe. However, cars with a green stripe can use men after 20 o’clock. 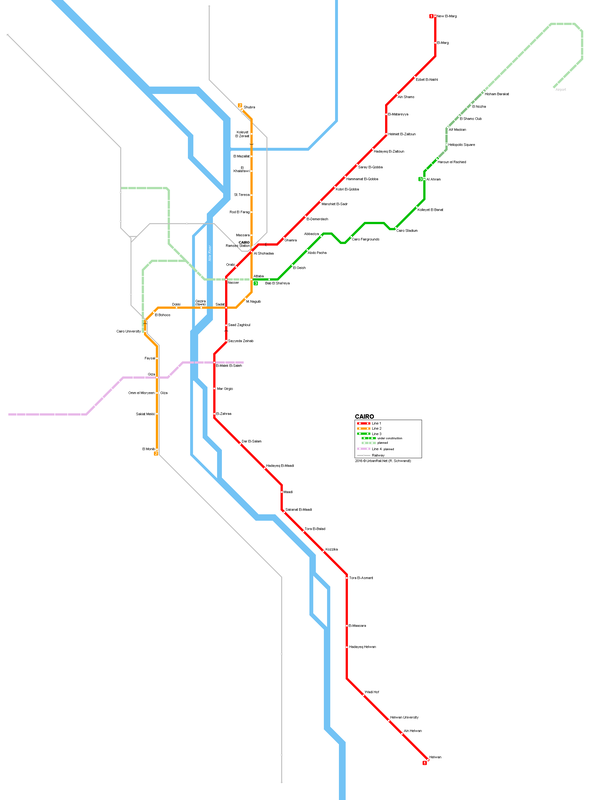 The Metro currently has 3 lines and the total route length is 77.9 km, spread over 61 stations. By 2020, Line 4 should also be opened and put into operation. Until last year, the fare 1 EGP (equivalent to $ 1.2) was one trip, independent of the distance traveled. A new price list is in place since 2017. Now you pay for one 2 EGP ride and for discounted fares, for children and students, 1 EGP. A new price list, which will depend on the distance traveled, should enter into force this year. For the 9 stations, you will pay 3 EGPs, 5 EGPs for 16 stations and 7 EGPs for more than 16 stations. The favored fare should again be a half less. You can easily buy tickets at any metro station. All 3 metro lines are in operation every day, from 5 am to 1 am. The exception is the likeness of Ramadan, during which the metro starts one hour earlier and ends an hour later. You rarely wait for more than a few minutes on the metro. The difficulty of the rides depends on the specific route, day and time. You can find out exactly the timetable without any problems on the spot. It is very easy to travel by bus as well. Bus transport is more time consuming and you can stay on crowded roads. You can best use it for transportation to other cities or excursions around. You can easily find timetable information directly on site. Another possibility of transport is a taxi, which is very widespread in the city. You pay for it quite a bit of money. However, we recommend that you use the UBER application, where you have the first free coupon for free! Would you like to stay stylishly and comfortably? The best way to get to know the local culture and find new friends is through Airbnb. Every time we travel to a new country, we use this way of accommodation. We can recommend him with a quiet heart. We have secured more for you a discount 35$ for the first stay – it worth to try. Whether you choose to visit Cairo for any reason, we wish you a lot of interesting experiences from this place. We hope that our article has helped you and that you now have a bigger idea not only about the city itself but mainly about how to move around it. We will be glad to share your impressions of Cairo with us in the comments below, and if you want to add a photo of the tours to it.